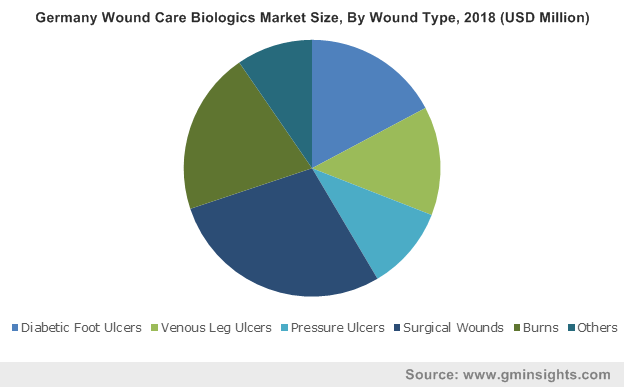 Wound care biologics market size was valued over USD 1.4 billion in 2018 and is expected to witness 9.5% CAGR from 2019 to 2025. Rising incidences of burn injuries specifically in developing and underdeveloped countries will positively impact the wound care biologics industry growth during the forecast period. Countries such as Africa and Brazil have high number of burn cases. For instance, according to WHO, around 180,000 deaths are caused due to burns in low- and middle-income countries annually. Burns not only have high economic impact but also has disastrous effects on the victim’s skin. Burns are classified depending upon the severity of injury, several treatment options are available. Wound care biologics is one of the widely preferred treatments in case of burns as it enables fast recovery with minimum or no complications. Therefore, availability of superior quality synthetic substitutes and it’s growing demand in treatment of burns has proven beneficial for the industry growth. Innovations in the wound care biologics will foster the industry growth in upcoming years. Key industry players operational in the wound care biologics industry spends rigorously on R&D to develop quality wound care biologics products. For instance, xenografts offered by the companies can introduce collagen in the wounds that enables dermal regeneration. The exogenous collagen provides three-dimensional structure for the tissue growth and these xenografts are absorbed after the wound has completely healed. Also, skin substitutes recently developed are extensively utilized for treating post-surgical wounds. Therefore, availability of superior quality wound care biologics will boost the industry growth in foreseeable future. However, high cost of the wound care biologic products may restrain the industry growth to some extent. Skin substitutes segment was valued at USD 940.6 million in 2018. Bioengineered skin and substitutes demand in surgeries has been growing in recent years. Also, recent advancements in skin tissue engineering have elevated its adoption amongst the doctors performing surgical procedures escalating the segmental growth. Bioengineered skin and substitute are one of the useful tools in reconstructive surgery practices prominently used as an alternative to skin grafts. For instance, allogenic acellular dermal matrix has high preference in the breast reconstruction procedures. Also, acellular dermal matrix products are utilized in diabetic-lower extremity ulcers. High usage of such superior bioengineered skin and soft in aesthetic procedures will drive the segmental growth during the forecast period. Topical agents’ segment will experience 8.9% CAGR during the forecast timeframe. Increasing demand for skin reconstruction and other aesthetic surgeries will drive the demand for topical agents. Phases of tissue repair are generally controlled by active topical agents. Also, topical agents have a vital role in tissue bio-engineering and are extensively preferred during the trauma cases that positively impacts the segmental growth. Pressure ulcer segment will experience 10.2% CAGR during the forecast timeframe. Increasing prevalence of pressure wounds such as bed sores will positively impact the demand for wound care biologics. Patients struggling with chronic diseases such as diabetes often have slower healing rates and are prone to bed sores. Also, patients with bone disorders are bed ridden and often suffer from bed sores. Moreover, pressure ulcers include serious complications such as cellulites bacteremia sepsis and septic arthritis that further stimulates the demand for wound care biologics escalating the segmental growth. Hospitals segment was valued at USD 665.5 million in 2018 and is expected to have substantial revenue size during the forecast timeframe. Significant revenue size can be attributed to the increasing use of wound care biologics in treating patients suffering from diabetic foot ulcers, pressure ulcers and skin burns. Moreover, high usage of allografts and other skin substitutes in the treatment of post-surgical wounds will flourish the segmental growth in forthcoming years. Ambulatory surgical centers segment accounted for 31.5% revenue share in 2018. Ambulatory surgical centres can offer lower-priced procedures as they have a lower cost structure compared to traditional hospital setting. Though the cost structures are low, the operational efficiencies are uncompromised that increases their preference. Moreover, ASCs are generally located in the suburbs and rural areas that provides patients with better access that should positively impact the segmental growth. U.S. wound care biologics market will experience 8.8% CAGR and is expected to grow substantially during the forecast timeframe. High growth can be attributed to the increasing perveance of diabetic foot ulcers. According to Azura Vascular Care, around 10% of people suffering from diabetes acquire chronic foot ulcers. Wound healing process is slow in patients with diabetes as the oxygen doesn’t reach most of the cells in the body that increases the chances of susceptibility for microbial and fungal skin infections. 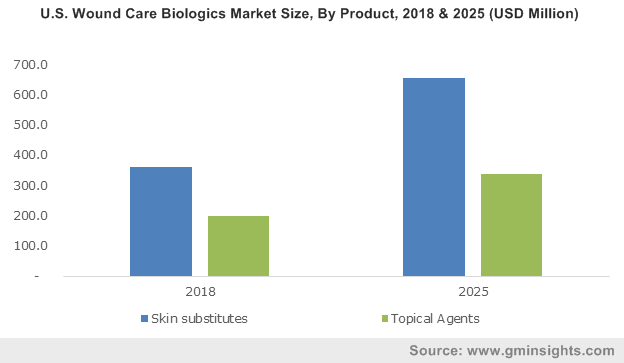 Moreover, growing preference for skin substitutes in aesthetic surgeries will augment the U.S. wound care biologics market growth during forecast timeframe. 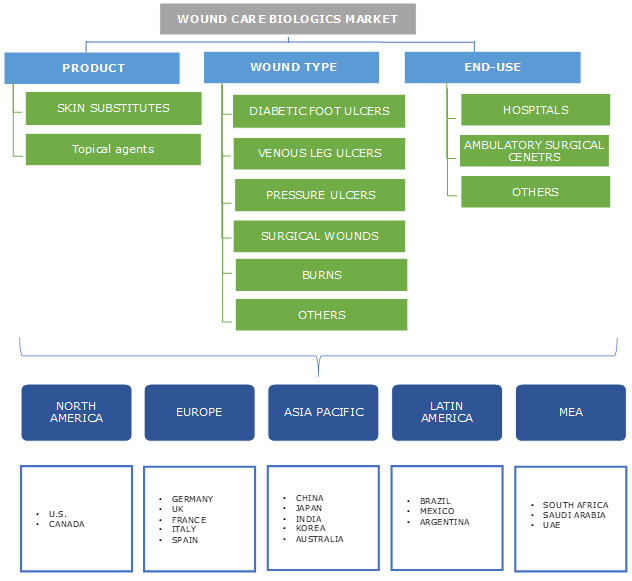 India wound care biologics market was valued at USD 55.3 million in 2018. 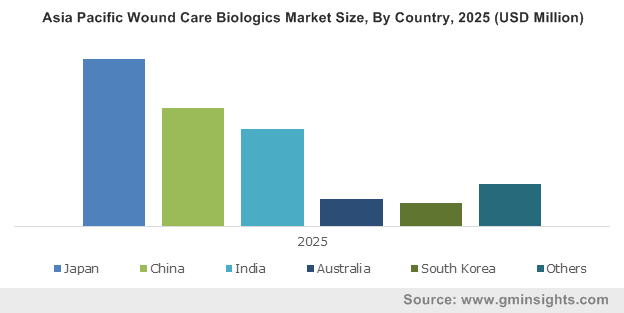 Growing number of burn cases will favor the India wound care biologics market growth. Third-degree burns are generally treated with skin grafts and bio-engineered skin tissues that enables quicker recovery. Moreover, growing geriatric population will positively impact the industry growth over forthcoming years. Key industry players operational in wound care biologics market includes Smith & Nephew, Integra Life Sciences, Mölnlycke Health Care AB, Mimedx Group, Wright Medical, Osiris Therapeutics, Derma Sciences, Kerecis, Amnio Technology, Solsys Medica and Skye Biologics. These key industry players implement strategies such as new product launches, mergers, acquisitions and collaborations to sustain in market competition. For instance, in April 2017, Skye Biologics & Human Regenerative Technologies launched BioECM membrane that has surgeries wound healing applications. Launch of new products will foster company’s revenue generation. Wound care biologics industry evolution can be traced back to 1793 that marked the usage of cotton gin in wound management. Since then, the wound care biologics industry has experienced significant evolution. Anti-septic dressings later replaced the conventional dressings available as the antiseptic dressings provided faster wound healing with minimum microbial activity. Currently, with progress in research and studies, wound care biologics such as biotechnologically engineered skin and topical agents have transformed the wound healing process making it easier and convenient. Also, key industry players create differentiation in the product offerings that creates numerous growth opportunities.